By 1353, Our Lady of Chartres had an organ and Jehan de Châteaudun was one of the cathedral organists. The instrument was installed on the double-ogival-vaulted wood-panelled tribune in the second bay in the southern wall that is still there today. In 1475, the clergy expressed their wish to build an organ at least as beautiful as the one in Poitiers Cathedral. Gombault Rogerie, a novice in the order of the Friar Preachers, built an instrument that played up to fifty pipes per note in the treble register, with two tall flat side towers separate from the central case. 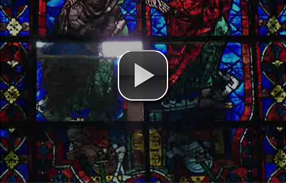 The organist Robert Filleul completely rebuilt the instrument on the old frame in 1542. He decorated the organ with numerous intaglio scrolls, heads sculpted in the round, masks, foliage and two corbels on the large towers and topped this arrangement with lamps similar to the ones at Chambord. The woodwork was the responsibility of a joiner called Foubert who employed a specialist joiner (huchier) called Beley to assist him. Both were local to Chartres. The organ had a separate stop. The sounding part was modified over time, but the size of the organ case remained exactly the same, with the exception of the positive, which was moved further forward in the mid-19th century. The Great Organ was continually maintained by the organ builders of the day: Roch d’Argilières, Robert Gouet followed immediately by Jehan de Heman and Pierre des Enclos, Lesclop, Renault (whose work was assessed by Thierry in 1742), and Adrien Lépine at the very end of the 18th century. In the early 19th century there was considerable discussion about moving the organ to the back of the nave. The fire of 1836 put it out of commission for ten years. In 1846 it was modified from a four-manual to a three-manual organ and painted a dark colour. Further work was carried out on the organ in 1846, 1850, 1868 and 1881. Altered in 1911, after which it was regularly maintained, by the nineteen sixties the organ was in very poor condition. 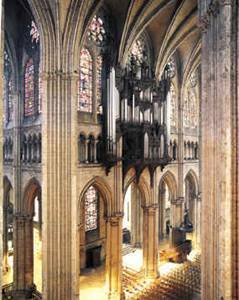 In 1964, Pierre Firmin-Didot founded an association and launched a national campaign which concluded with a number of major events held in 1971 to inaugurate the Great Organ, which had been completely rebuilt in the neoclassical style by the Danion-Gonzalez company. The organ was modified from three manuals and 36 stops to four manuals and 67 stops, and an electro-pneumatic transmission was added. Since then, in addition to its main use in cathedral services, the Great Organ has formed the centrepiece of a programme of cultural events, some of which are organised by the Association des Grandes Orgues de Chartres. The key events each year are the summer festival and the world-famous international organ competition the Grand Prix de Chartres, held every two years.